Many, many years ago, when I worked for The Comics Journal, I created a feature called "Swipe File." In it, we exposed examples of when one comics artist had swiped an image from somewhere else (usually another comics artist). This is a really common practice. Sometimes it's just a matter of using a striking visual solution that another comics artist came up with instead of trying to come up with one of your own. (Deadlines often cause comics artists to resort to such matters.) But sometimes, the swipes were deliberate homages to artistic influences and inspirations. In the art world, this is called appropriation, and there are all sorts of theoretical justifications for it. Not so much in the comics world--it's considered a misdemeanor at worst, and is generally slightly frowned on. Anyway, Swipe File was our response to the phenomenon. So when I noticed this (see below), I decided to revive Swipe File. I saw the Matt Messinger painting at a show earlier this summer. We know this painting must therefore date from July of this year or earlier. Tom Neely is a very talented and creative cartoonist, but I have no idea when he drew this comic. I can't tell, therefore, if Messinger copied Neely, or if Neely copied Messinger, or if the two of them copied some third party. (It seems pretty unlikely that they both came up with this concept individually--the drawings are too similar for that.) So someone committed the artistic misdemeanor of swiping--but the question is, who? UPDATE: I ran into Matt Messinger the other night and asked him the origin of the Popeye "tornado of arms" image. He told me it was from one of the old cartoons (presumably the Fleischer Bros. cartoons. So it appears that both Messinger and Neely "swiped" this image. This seems like more than just a misdemeanor. I think the reason that the comics world considers this kind of thing a misdemeanor (and perhaps why the art world doesn't consider it a moral issue at all) is because these are one-off things. Within comics, it is usually one panel out of hundreds in a given comic book. So it's a little like shoplifting--it's not as bad as grand theft. I tend to look at it as an image versus a use of image. It is kind of a double standard in a way. I think the comics world places a different type of value on drawing than does contemporary art. I like Matt's work and this one in particular reminds me a bit of Baechler who also made good use of comic images over grungy, painterly grounds. I'm inclined to let him off the hook. Well, we don't know if Matt is "guilty" here. But here is a hypothetical question: would it make a difference if you hated Matt Messinger's work instead of liking it? Probably not. I still wouldn't like it, but not because he appropriated something. It's like watching a cover band- enjoyable, but smacking of careerism and an aesthetic of just going through the motions verses a passionate creativity. The iconic quality of Popeye somewhat mitigates the swiping, but it's still unethical from an artist's stand point. The question for the audience, not concerned with the commercial/intellectual property side of things, is: did the artist make it his own? Are you saying that the Emerson String Quartet, which does nothing but play the compositions of other composers, lacks passion or creativity? Assuming Messinger swiped it from Neely (which I don't know to be true and make no claims for), doesn't seem clear that Messinger "made it his own"? The drawing is distinct and different. It feels more finely etched and more old-fashioned. 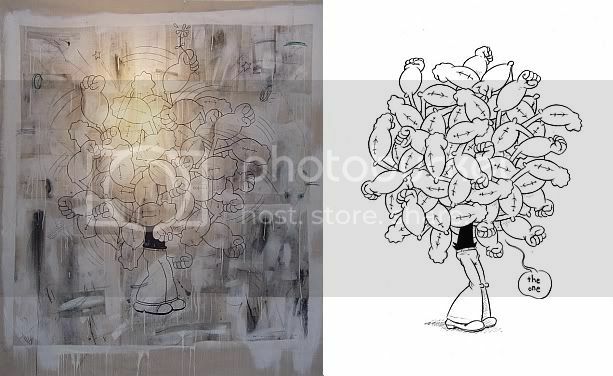 And, of course, he did it on a piece of blotchy distressed canvas, which gives it an antique feel as if it were a relic from the 1930s, when Popeye was in its original heyday, written and drawn by the immortal E.C. Segar. I was using passionate as an adjective modifying creativity, and my answer would be yes, relatively speaking. One needs some amount of passion to play in a quartet, or play anything for that matter, but playing sheet music and composing it are doubtlessly unequivocal in their creativity. Comments here are about cover bands might be off the point. A swipe is when you appropriate another image (or creative act), and present it as your own work, your own idea. If you make it clear your original source, you are not really "swiping". In the case of the sample here, there are two artists putting up the same image, neither of which seems to have noted an original source. Clearly at least one of them, therefore, is guilty of a swipe. What if you go to a club and a band plays a song that is actually another band's song. They do not at any time announce this fact. (This very scenario certainly happens hundreds of times every week in the USA and around the world.) Is that, then, a "swipe" and if so, is it wrong? The argument to not announce the song as a cover usually runs along the lines that all the cool people will know it's a cover and can chortle snobbishly to themselves. It's a swipe if not declared. Responses to music are very much more conditioned by upbringing than one's visual sense is, so a cover is like a third degree misdemeanor. Let's not talk about sampling. It's hard for me to see a reinterpretation (which a good cover is--and which Matt Messinger's piece is--assuming he is in fact the swiper) as a misdemeanor in any way. But that's all I'm going I'm going to say about it. I think we've killed this subject.